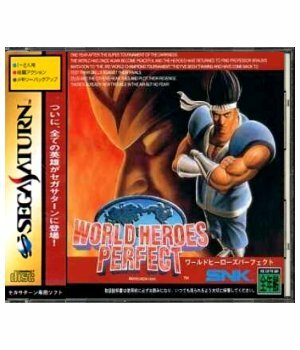 World Heroes was one of those games that unfortunately came along in a time where any fighting game that wasn't Street Fighter 2 or Mortal Kombat was automatically considered a "rip-off" of one of those, written off and only spoken of in derision afterwards. Why this is still case 20 years on, I don't know. Either folks just love SF2 THAT much or they are simply content in basing their judgment on a singular impression made long before, gleefully ignoring any biases that may have influenced it the time. I just think it's a shame, because many of the 'B-list' fighters of the time (including Fighter's History) had very solid and fun sequels... and they went virtually ignored because of this stigma. 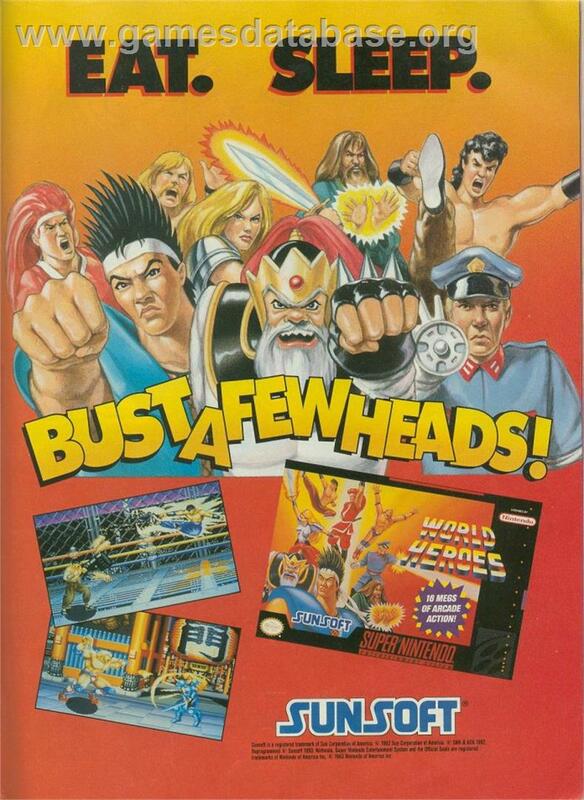 Even Fatal Fury, now revered as part of SNK's great fighting game lineage, wasn't immune to this and was called an outright rip-off along with the rest! Nevertheless, despite having a soft spot for the series. I have to admit the first one was pretty mediocre, even the art on the magazine ad for it looked pretty crap. Still, even from the watered down SNES port we rented one weekend (I never got to play the original in the arcades), I could see it had some worthwhile things to offer. I think it says a lot that even on a system like the NEO GEO, which was known for it's eye-catching, colorful visuals, World Heroes stands out with some cool, imaginative effects for it's character's special attacks. Between Dragon's awesome fiery flying kick, Rasputin's giant hands and Hanzo and Fuuma's twirling dragons, it frankly made the competition look... boring. Personally, I don't think even SNK's own measured up until around the time Fatal Fury transitioned into Real Bout. Yes, it was argued that Brocken was essentially Dhalsim in M. Bison's clothes (or in hindsight, Dhalsim repackaged as a certain Kinnikuman character) but he was still pretty damn cool. There was just some undeniable appeal to playing as what was basically the fighting game equivalent of Inspector Gadget, who was complete with a hidden arsenal of guns and other devious machinery. Fitting in with it's gimmick of using ersatz historical figures (Janne, J. Carn) and pop culture "heroes" of modern times (Muscle Power, Dragon), we also have Rasputin. Not only is he a tremendously unique character for a fighting game, he also reveals just how lighthearted and silly the game's general mood and take on history are. World Heroes just does not take itself seriously at all, and that's a quality I can admire in any video game. Other than those and a few other positives, it played well enough; but it simply wasn't great. Once I happened upon the sequel in the arcades, though, I changed my mind about the series pretty quickly. The game was faster, more fluid, and newcomers such as Jack and Captain Kidd were just too cool to ignore. Put it this way, before the sequel, I was just as content to ignore the 'Heroes as everyone else was; but that memory of playing WH2 easily ranks as highly for me as my first time playing Samurai Shodown or Mortal Kombat 2, games few will deny as being classics now. I didn't get to play further incarnations of WH2 (Jet and Perfect) until arcade emulation had become widespread; but it made me happy to know that the series had lived on at least a little longer and I was hungry to seek out any console versions I could find. It turns out WH2 was just as excellent on the SNES - making up for any audiovisual inequalities by configurable controls and nifty speed options, Jet made a darn fine portable fighter for the Game Boy, and I probably would've been content with simply owning the World Heroes Anthology put out a few years back if my PS2 hadn't died shortly after. My Sega Saturn still works as well as it did the day I brought it home from a local thrift store, however, so I didn't hesitate when the opportunity came to own Perfect for it. To be honest, it's not my favorite in the series. Sure, it has all the wacky finishers (Rasputin's Love Garden is LEGENDARY) and somewhat more smoothed and fleshed-out gameplay; but I still prefer Jet...if only slightly. Playing this version just made me remember some of the specifics why. - Certain moves are inexplicably difficult to execute when they could be easily performed before. 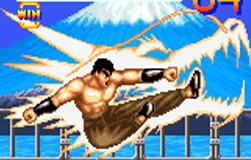 Dragon's flying kick, for instance. This effectively neuters one of his most useful and combo friendly moves. - CPU is very aggressive and downright cheap, even on the lower settings. They happily knock you out of moves every chance they get while you're struggling to figure out why they aren't working. I understand these may have been directly transported from the NEO version - the words "MVS difficulty" strike fear far and wide; but I still wouldn't recommend anything above Normal unless you consider yourself an expert. There aren't many extras to speak of in this version either, other than a mode that gives gameplay tips and background info on the characters (I think..it's all in Japanese); but practice modes and the like weren't exactly common in console fighting games back then, so it's forgivable. It does have a nice re-arranged soundtrack, though, always a big plus. In conclusion, while I'd like to recommend a Virtual Console version of WHP or WH2J over this, they aren't available (not in the US at least.) Having another great fighting game for your Saturn is always cool; but I'd say get the Anthology if you have a working PS2 instead, and while you're at it, grab Fighter's History Dynamite/Karnov's Revenge for the VC. Celebrate the unsung fighters of times past!